These thieves in the night are very successful. Ellen Buford got up at 9AM. She got ready to go to the bank. When she arrived at the bank at 9:45 AM she was in shock over what she saw. She saw five Lake Wales City Police cars outside the bank. The bank manager was outside talking to the police. She walked up to them and asked "what happened?" An officer said "last night this bank was broken into. The Red and Yellow Thieves did it." The officer said "The Red and Yellow Thieves." Ellen said "I've never heard of them." Another officer said "there are three of them and they wear red and yellow paint to disguise themselves. Luckily the light under the surveillance cameras was good." The first officer said "they hit this bank last night along with a store around the block. They're the fastest bandits ever." Ellen said "oh you make them sound like three Zorros." The second officer said "they practically are just like him. They stole the pants off a store clerk while robbing a store in Georgia." A couple of officers laughed and Ellen threw a fit. As Ellen exhaled she said "I'll just have to go to an ATM." 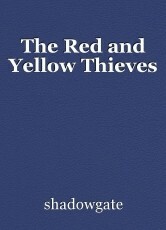 The Yellow and Red Thieves ran wild last night and were still at large.